The Enerchi Charm is part of the Riftwalker Set. 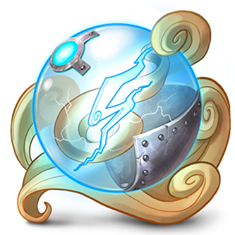 This charm harnesses the enormous residual Enerchi generated by simple movements within the Furoma Rift. This charm will generate 2 Enerchi whenever a mouse is caught anywhere throughout the entire Kingdom. The Enerchi Charm is dropped as loot by several mice in Furoma Rift. It can be traded on the Marketplace and given to friends. Using Enerchi Charm will generate 2 extra Enerchi for every mouse caught in any location, not just Furoma Rift. When used with Enerchi Induction Base, their combined effects will generate 4 extra Enerchi every catch, even if the mouse caught does not drop Enerchi. When used with Attuned Enerchi Induction Base, their combined effects will generate 5 extra Enerchi every catch, even if the mouse caught does not drop Enerchi. 18 May 2016: Enerchi Charm was released with the release of Furoma Rift.